September 1996. Hemyock Bowling Club Ladies, after receiving the Ladies President Trophy. Standing L to R. Jean Andrews, Beryl McCulloch, May Saunders, Helen Lancaster, Anne Gale, Muriel Collins, Sue Piers, Di Groves, Geraldine Gibbins, Maggie Knowlman, Pearl Hurley, Daphne Symes, Gladys Thompson. 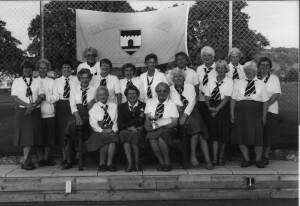 Seated – Mollie Lutley, Nellie Fox-Robinson, Maureen Robertson, Ann Barnden, holding the trophy, who was the ladies captain for 1996 and Mary Hawkins.